INDIANAPOLIS – When it comes to calling a team a dynasty, three seems to be the magic number. 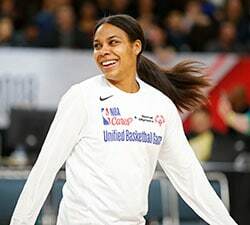 With a win over the Indiana Fever in Game 5 of the WNBA Finals 2015, the Minnesota Lynx cemented themselves as the WNBA’s modern dynasty with its third WNBA title in the last five years. The Lynx now join the Houston Comets, Detroit Shock and Phoenix Mercury as the only franchises with at least three championships. The Comets have the most ever, having won the first four WNBA crowns from 1997-2000. Minnesota’s dominant stretch of three titles in five years — and four trips to the Finals in that span — is matched only by Houston’s dynasty. Detroit’s achievements equal that of the Lynx — three titles in four trips to the Finals — but Detroit did so in a six-year span. The start of the Lynx dynasty coincides, not surprisingly, with the arrival of Maya Moore, the No. 1 pick in the 2011 WNBA Draft. 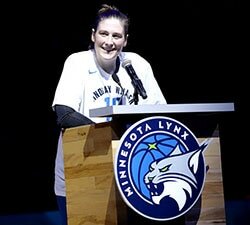 In Moore’s first season, the Lynx went from a team that went 17-17 the season prior to a team that went on to win the franchises’s first title in 2011 against the Atlanta Dream. After losing to Indiana in four games in the 2012 WNBA Finals, the Lynx came back to defeat the Atlanta Dream again in the 2013 Finals. The Lynx failed to make the Finals in 2014, losing to the eventual WNBA champion Phoenix Mercury in the Western Conference Finals, before coming back and exacting revenge on the Fever and winning the title in 2015. Consistency has obviously been a main factor in Minnesota’s sustained excellence. At the forefront of this is Minnesota’s core, highlighted by a trio of Olympians in Moore, Seimone Augustus and Lindsay Whalen. 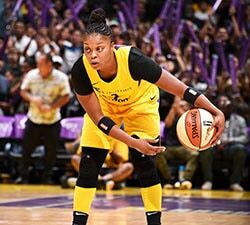 Forward Rebekkah Brunson has also been a pivotal piece throughout this run, but Minnesota’s dynastic combination of these three players brings up comparions to Houston’s trio of Cynthia Cooper, Sheryl Swoopes and Tina Thompson.